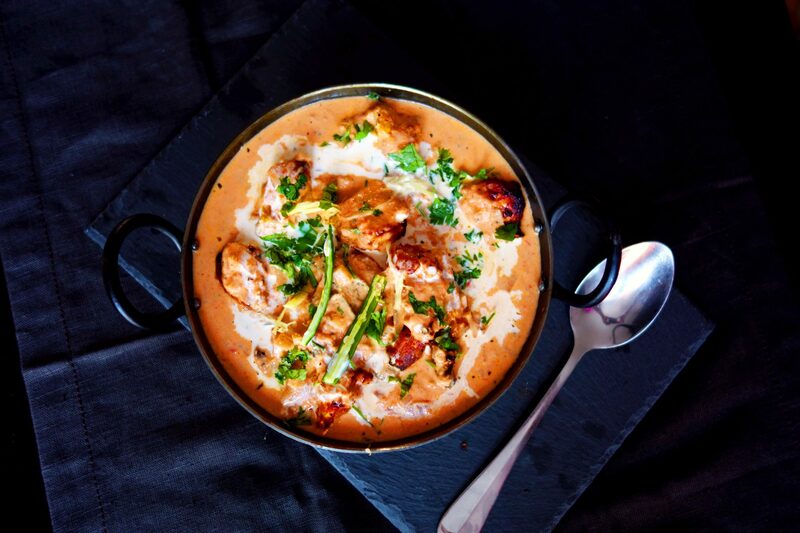 Butter chicken or Murgh makhani, are at the top of the list of favourite foods of any chicken loving person. Ask any non vegetarian Punjabi, and his favourite food would be butter chicken.And why only a Punjabi… I guess anyone and everyone loves ‘the butter chicken’. I used to think that only punjabis love their butter chicken, but as I grew up and moved out of Punjab, met more and more people from different backgrounds and different parts of India, I realised that butter chicken was nations one of the favourite dishes, and now I realise that its not only nations favourite, but anyone who is a non vegetarian and likes Indian food, has butter chicken as one of his /her favourites’,and that really made me think.. WHY? ?… YES, WHY NOT??? Even though it cannot be called a healthy , fresh or clean food, but the taste and the flavour is something that makes you fall in love with it!! !And you don’t need to have it everyday, you can have it once a while. 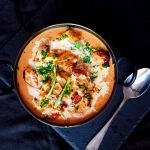 This creamy textured, butter flavoured, tandoori chicken pieces,dipped in rich tomato and cream gravy sum up some beautiful rich flavours, that are neither too spicy, nor too bland, but perfect for every taste bud.Hence it is loved by all. 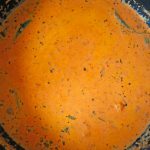 And of course, when you are making “butter chicken” , in its authentic avatar, you cannot compromise on any of the ingredients that adds to its taste and richness. The real butter chicken, cannot be tagged as “free from”! 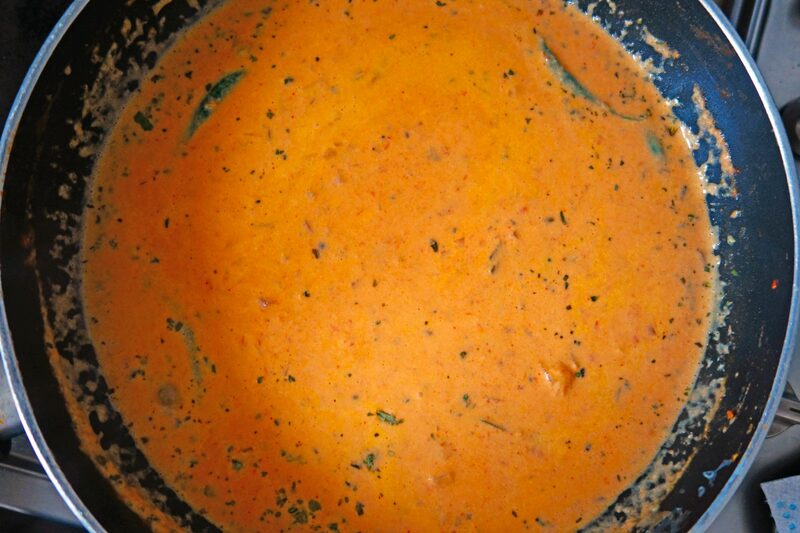 !You do need to add a good amount of butter and cream , to get that authentic butter chicken taste. If for any health reasons , you need to avoid dairy (yoghurt,butter and cream) ,I am suggesting a few alternatives below. 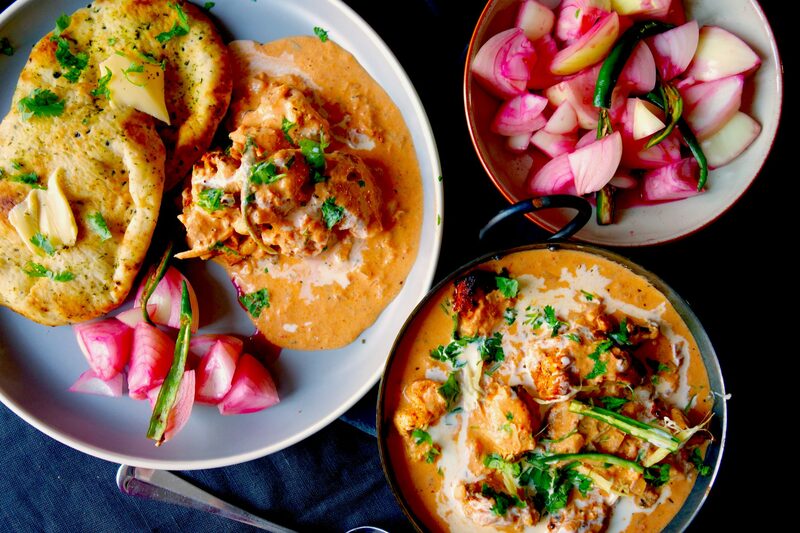 Using below alternatives, this dish cannot even be called butter chicken as there is no butter in it, but still it is the closest to butter chicken, as rest of the ingredients remain the same. 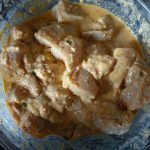 The taste will vary a bit, and it won’t be as buttery but of course , nobody should have an excuse, to not have butter chicken !! Use regular cooking oil/ olive oil instead of butter,if you do not want to use butter at all. Instead of cream, you can use cashew paste – It is a good alternative for dairy free cream. 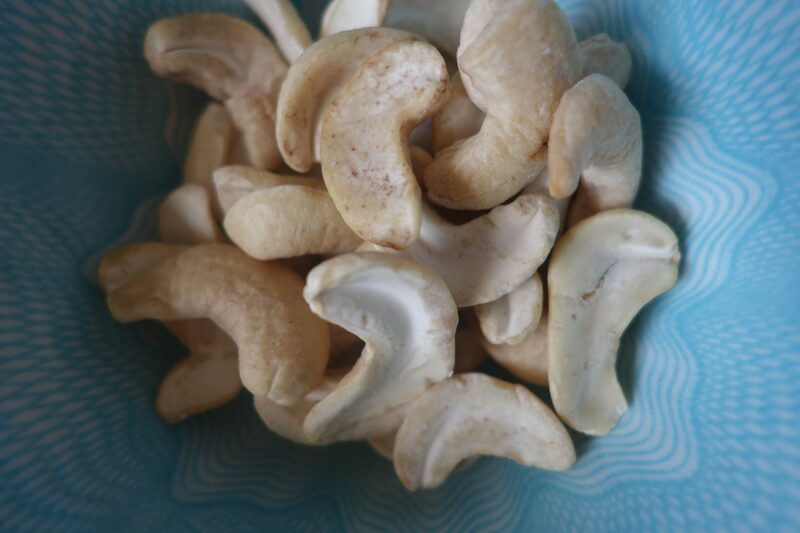 Dip half cup of cashews in warm water for half an hour or more. Once they are a little soft, blend therein a blender to make cashew paste. 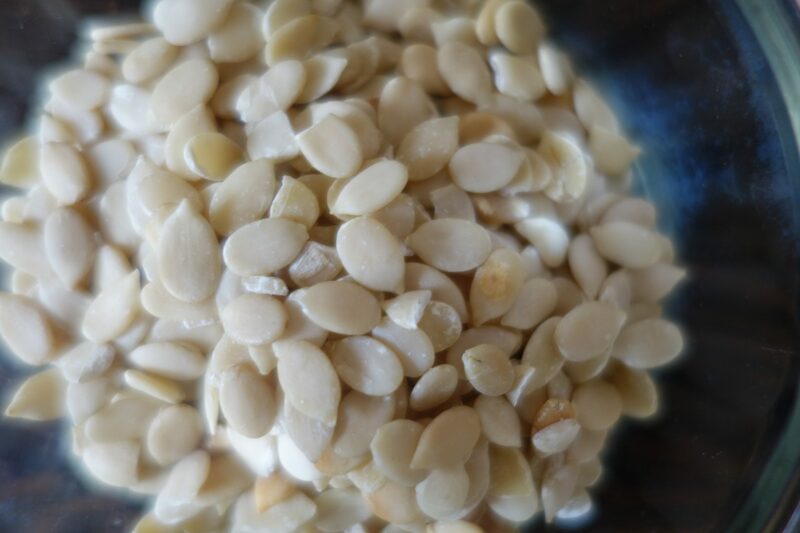 If you do not want to use too many cashews, you can even use cashew and muskmelon seeds paste. This is a good and healthier alternative to using cream, or just cashews.To make this take 1/4 cup of cashews and half a cup of musk melon seeds. mix both and dip in warm water for half an hour or more. Once soft, blend these in a mixer/ blender to form a paste. 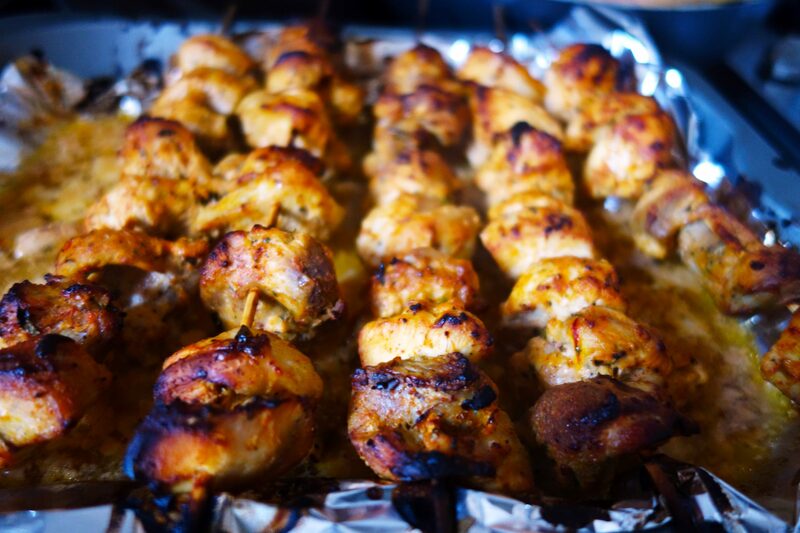 In this recipe, i have used yoghurt in the chicken marinade. 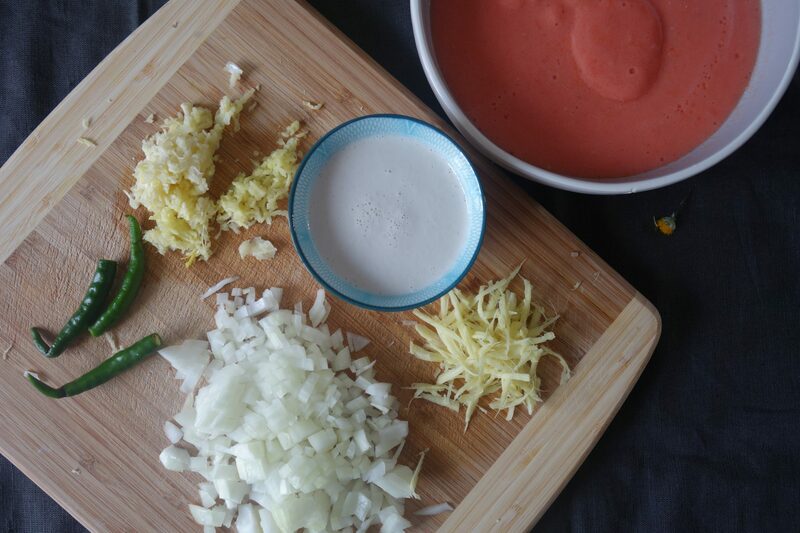 However if you do not want to use yoghurt , completely skip adding it to the marinade. 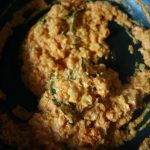 Or else,Instead make a paste of a tbsp of chickpea flour and little water and add it to the marinade inlace of yoghurt and add rest of the spices as in the recipe. The above alternatives are only incase if you want to avoid adding any dairy products, for maybe health reasons, or any other reasons. Otherwise I would really suggest you use the real ingredients to enjoy the real butter chicken! !As I always say, workout a little more the next day, but enjoy the true taste of real natural food:), and anyways as I said,nobody eats butter chicken everyday , just enjoy it once in a while. 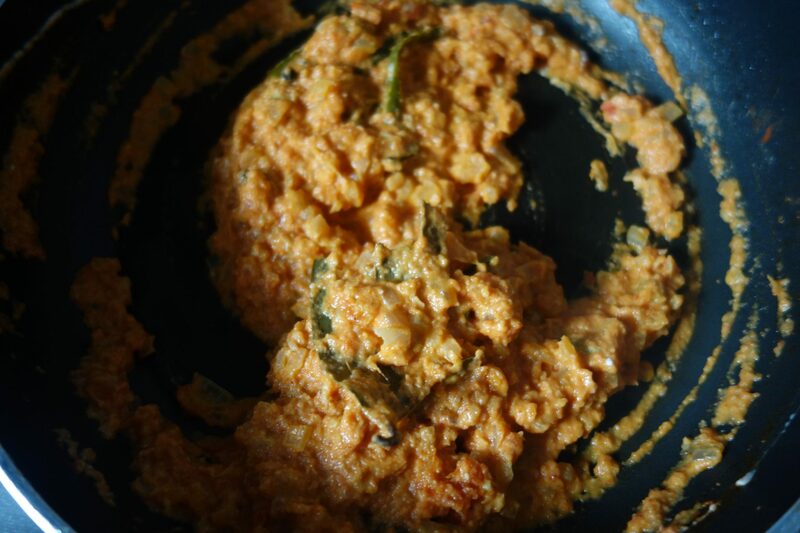 For my recipe, I have actually used, cream, as well as cashew/melonseeds paste , to make the taste more rich. As I said earlier, you can use just cream as well. 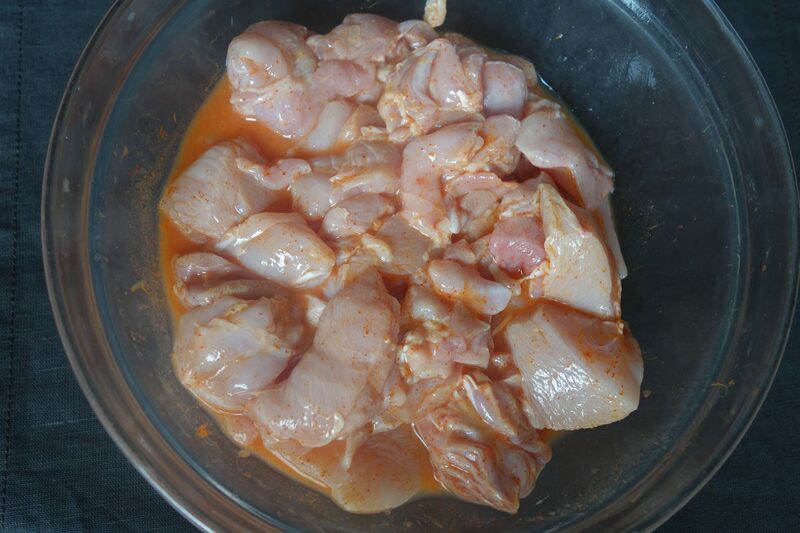 Preparing Chicken Marinade-This involves two marinades. 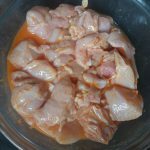 This is a very simple step, and doing this step helps to make the chicken pieces really juicy and soft. 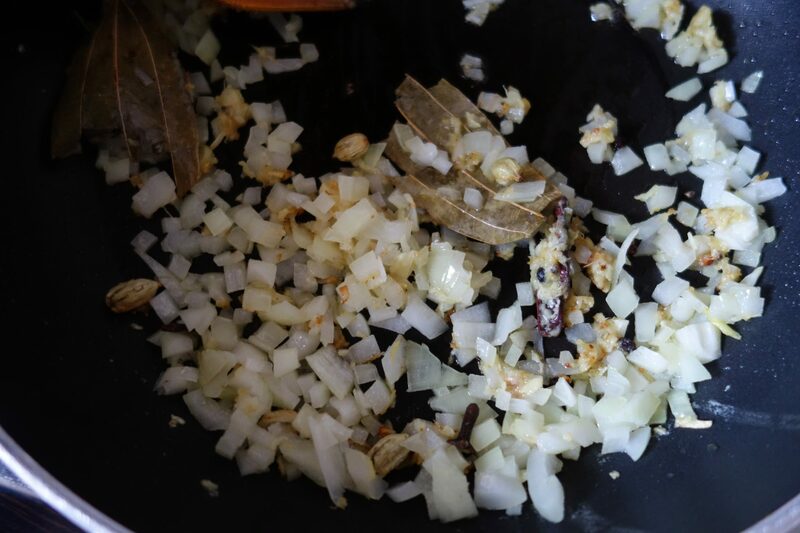 This step simply requires making a marinade of salt, chilli powder(you can use degi mirchi powder, Kashmiri chilli powder or paprika) and lemon juice.Add chicken pieces, and mix well. Cover with cling film, and keep in the refrigerator for half an hour. 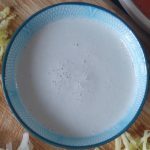 For the second marinade you need Yoghurt (If the yoghurt is too thin, you can hang it in a muslin cloth for 30 minutes, so that the excess water drains out, and then use the curd. 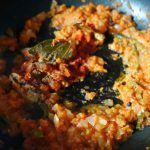 Or you can even use greek yoghurt, or homemade curd),little mustard oil, a pinch of saffron dipped in 1 tsp of warm water, cumin powder, tandoori powder (this is easily available in any asian store, or even amazon), few cloves garlic, slice of ginger, a green chilli, garam masala powder, kasoori methi, chilli powder. Though most of the restaurants, add a little red food colour to give that nice smoky red colour to the grilled chicken, I am not adding any colours. 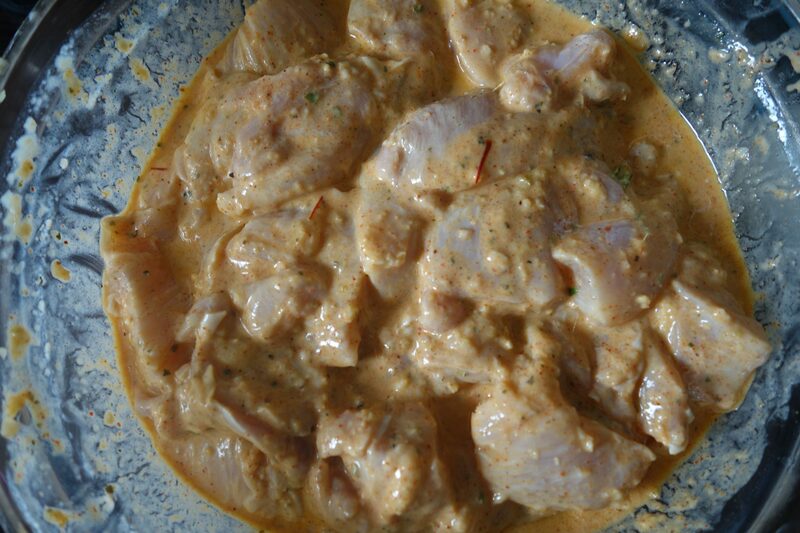 Adding saffron gives a little colour to the chicken, and it is natural,so a better alternative to using food colours. 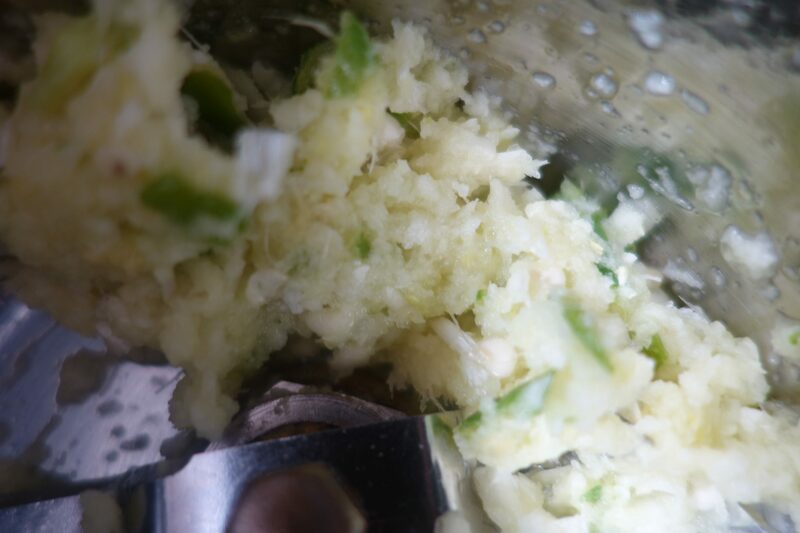 Make a rough paste of the garlic/ green chilli and ginger. 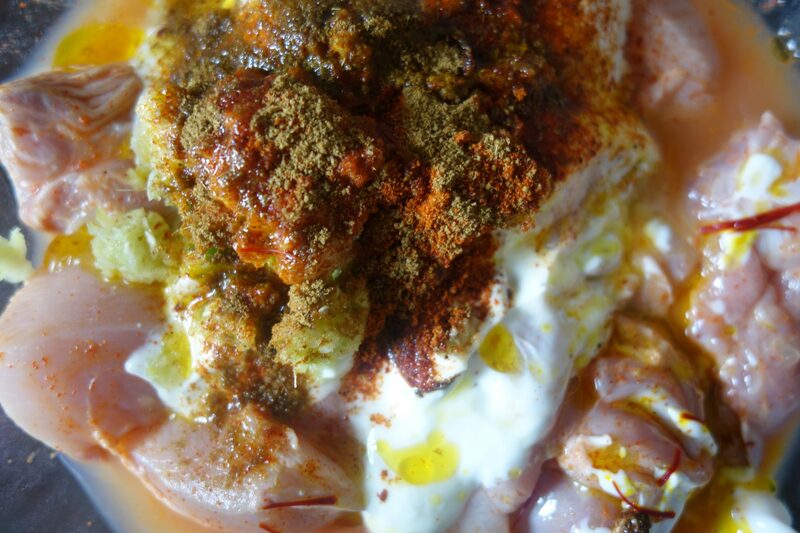 Mix all the ingredients of the second marinade together – yoghurt, garlic ginger chilli paste,mustard oil, saffron, cumin powder, tandoori powder, garam masala powder, salt, hand crushed kasoori methi ,red chilli powder. 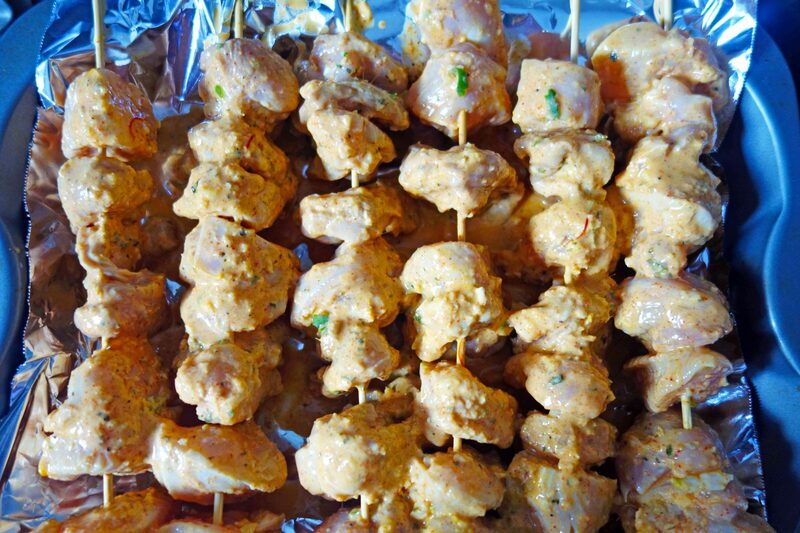 Add the marinade over the chicken pieces (which are already marinated in the first marinade), and cover these well with the second marinade.Mix well. Cover the bowl with a cling film, and keep marinated in the refrigerator for a minimum for 4-5 hrs, or even overnight if you are preparing these ahead of time. 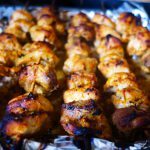 Once the chicken is marinated , put the pieces on the skewers, and bake it in the oven at 180 degrees for about 15-18 minutes, turning the skewers once in between so that all sides are nicely cooked. Once it is done for about 15 minutes, brush a little butter on the pieces, and then grill it in the oven for about 5 minutes. This gives a nice chargrilled effect to the pieces. 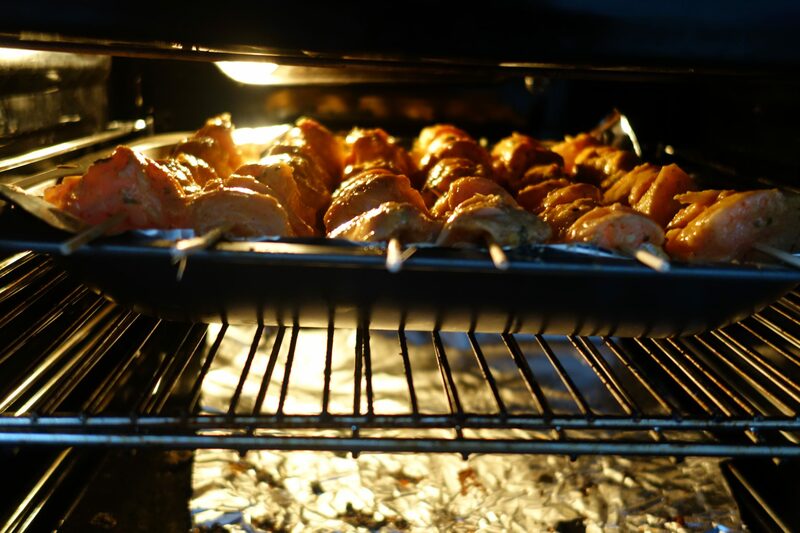 If you do not have an oven, you can use the pan to cook the marinated chicken. Add a little butter in the pan, and lay down all chicken pieces in single flat layer, and cook them for about 7-8 minutes on one side. Then turn the side and cook nicely on all sides. For the gravy you would need butter,2-3 tbsp of butter. You can use homemade white butter, or you can use store-bought butter . Use either salted, or unsalted butter. Just adjust the amount of salt in the dish according to the butter you are using. 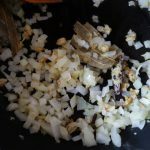 Also you would need a small onion, tomatoes, crushed/grated ginger garlic, green chillies, whole spices- bay leaf,cardamom, black peppers, cloves, cinnamon stick, cream, sugar (or honey or jaggery),salt, chilli powder, deli mirchi powder, garam masala powder,kasoori methi. If you are using cashew/melonseed paste. then you would of course need cashews and melon seeds. 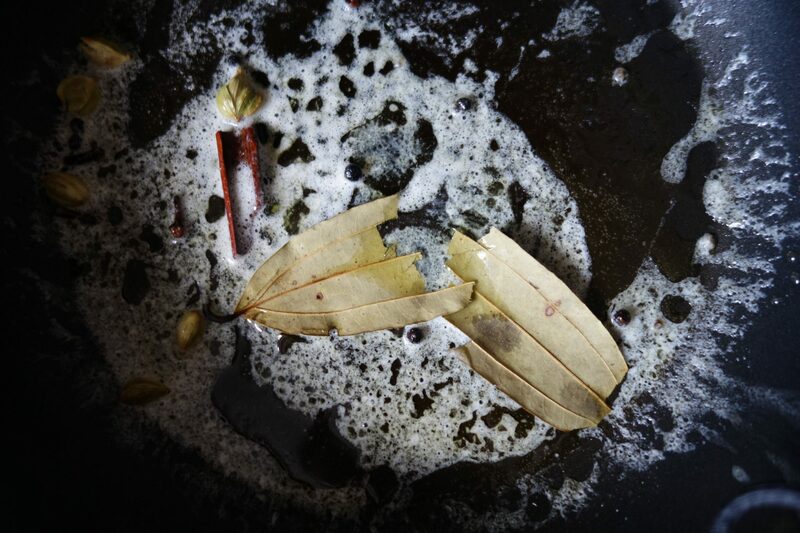 In a thick bottomed pan, heat butter Add bay leaf, and the whole spices-cardamom, black pepper, cloves, cinnamon stick.Temper this for a minute.Add grated ginger and garlic, sauté these for 2-3 minutes, till the raw aroma goes away.Add chopped onions, and sauté, till these are golden brown.Add pureed tomatoes, and sauté till the masala leaves oil on the sides, and is done. If you are using the cashew/ melon seeds paste, add the paste at this step, and mix well. 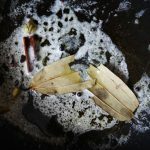 You need to keep stirring so that the paste does not stick to the pan. This would need 2-3 minutes on medium heat.If you are just using cream, then proceed to the next step.Cream will be added in the end. 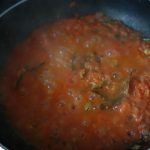 Now add the dry spices-salt, red chilli powder, Kashmiri chilli powder, garam masala, kasoori methi.Mix well.Add a cup of water, and simmer for a minute, till it starts boiling. Once everything is done- the chicken is cooked and the gravy is ready, add the tandoori chicken pieces in hot gravy and simmer for 4-5 minutes. Add a dollop of butter, and a splash of cream. Garnish it with ginger jullienes, and slit green chillies. 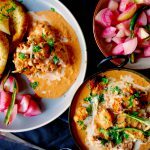 Serve it hot with butter naan, and Indian pickled onions. Let me know when you try this recipe. Leave a comment if you like it.Detailed recipe below. 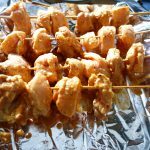 Chunky juicy tandoori chicken pieces dipped in buttery tomato gravy. Mix lemon juice, salt and Chilli (either of the three-paprika/ degi mirchi powder/ Kashmiri chilli powder). 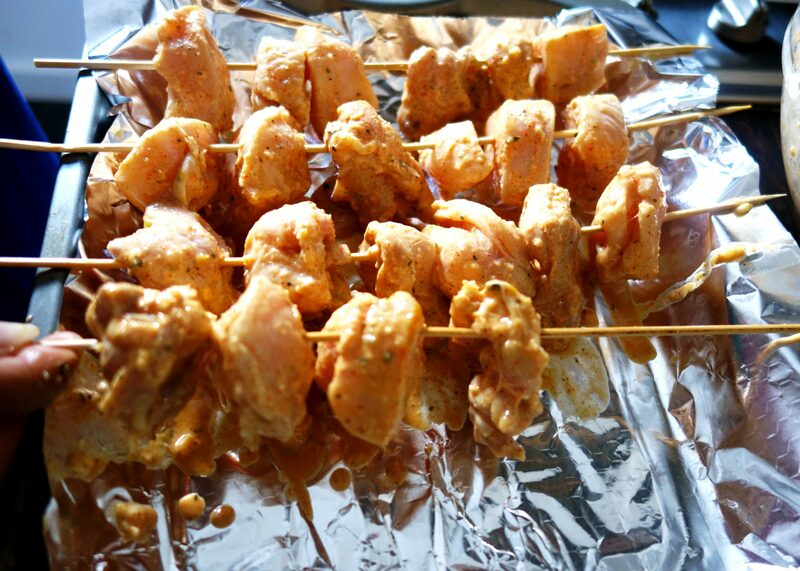 Mix all the ingredients of the second marinade together - yoghurt, ginger garlic green chilli paste, mustard oil, saffron dipped in water, cumin powder, tandoori powder, garam masala powder, salt, hand crushed kasoori methi ,red chilli powder. 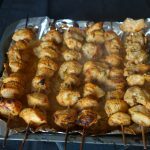 Pour the marinade over the chicken pieces (which are already marinated in the first marinade), cover these with the second marinade.Mix well. If you are using cashews and melon seeds- Make a paste of these. In a thick bottomed pan, heat butter . 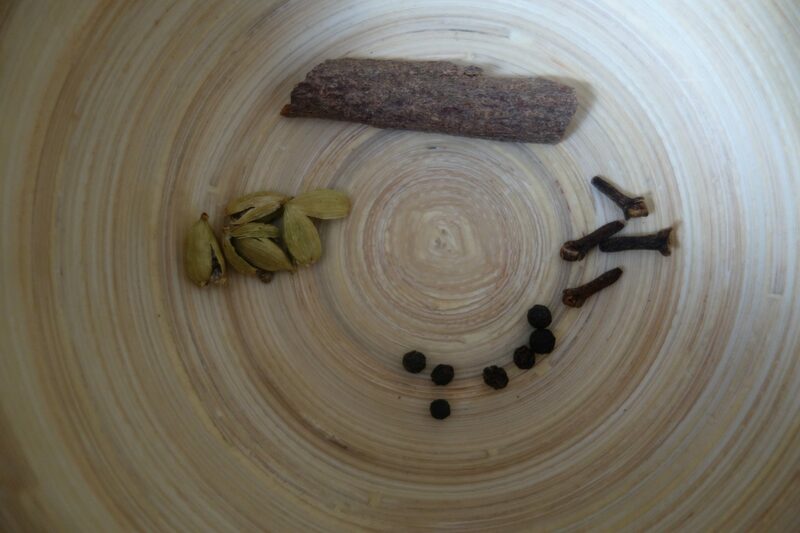 Add bay leaf, and rest of the whole spices-cardamom, black pepper, cloves, cinnamon stick.Temper this for a minute. 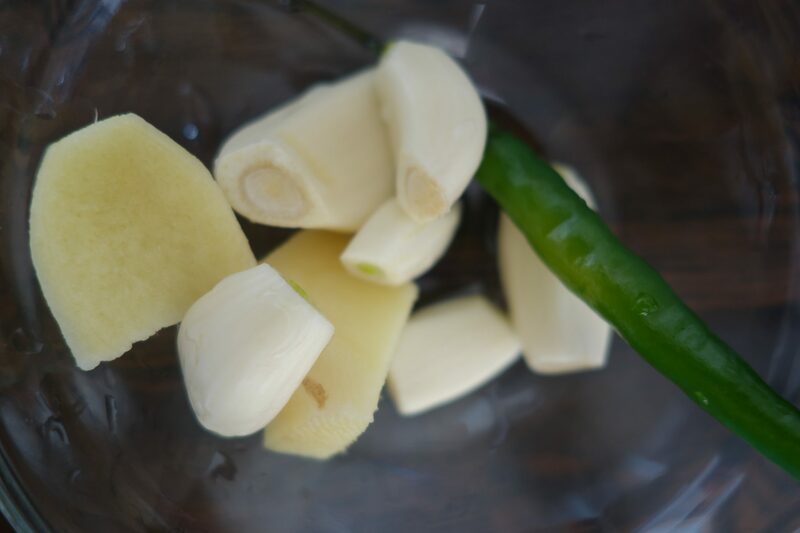 Add grated ginger and garlic, sauté these for 2-3 minutes, till the raw aroma goes away. Add chopped onions, and sauté, till these are golden brown. 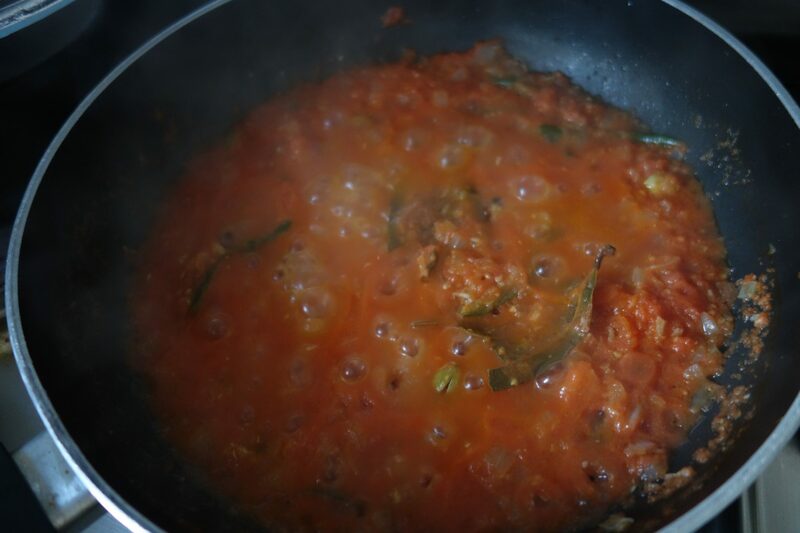 Add tomato puree, and sauté till the masala leaves oil on the sides, and is done. If you are using the cashew/ melon seeds paste, add the paste at this step, and mix well. You need to keep stirring so that the paste does not stick to the pan. This would need 2-3 minutes on medium heat. Now add the dry spices-salt, red chilli powder, Kashmiri chilli powder, garam masala, kasoori methi.Mix well. Add cream, and mix well. Add a little sugar or honey. You can even use jaggery to sweeten this.Mix well. Turn them once after 10 minutes, so that it is done on all sides. once almost done,Brush butter on the chicken pieces.and grill it for almost 2-5 minutes. Once everything is done- the chicken is cooked and the gravy is ready, add the tandoori chicken pieces in hot gravy and simmer for 4-5 minutes. Add a dollop of butter, and a splash of cream.Mix. Garnish it with ginger jullienes, and slit green chillies, more cream. Serve it hot with butter naan, and Indian pickled onions. 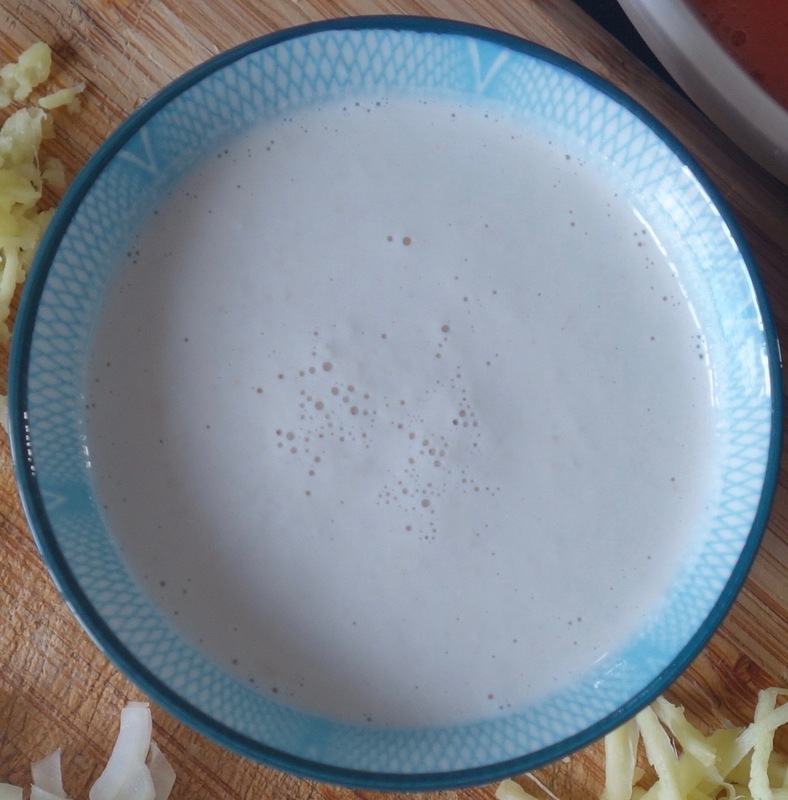 Instead of cream, you can use cashew paste - It is a good alternative for dairy free cream. Dip half cup of cashews in warm water for half an hour or more. Once they are a little soft, blend therein a blender to make cashew paste.